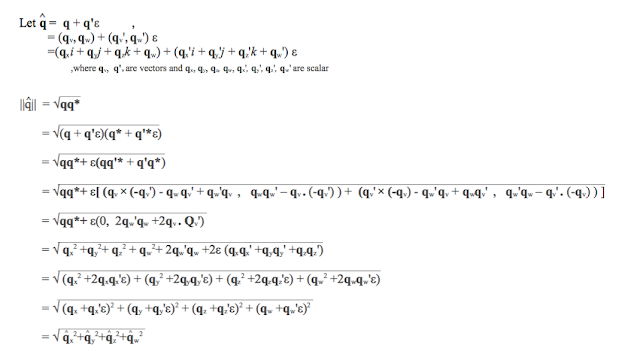 which is in terms of 2 quaternions (real part and dual part). note that the norm of a dual quaternion is a dual number. Sometimes it is convenient to have methods to convert between Unit Dual Quaternion and Matrix. Assume we have ordinary quaternion - matrix conversion functions. Therefore, we can find the rotation matrix by considering the real part of the dual quaternion while the translation (i.e. tx, ty, tz) can be solved by using system of linear equations by equating coefficients. 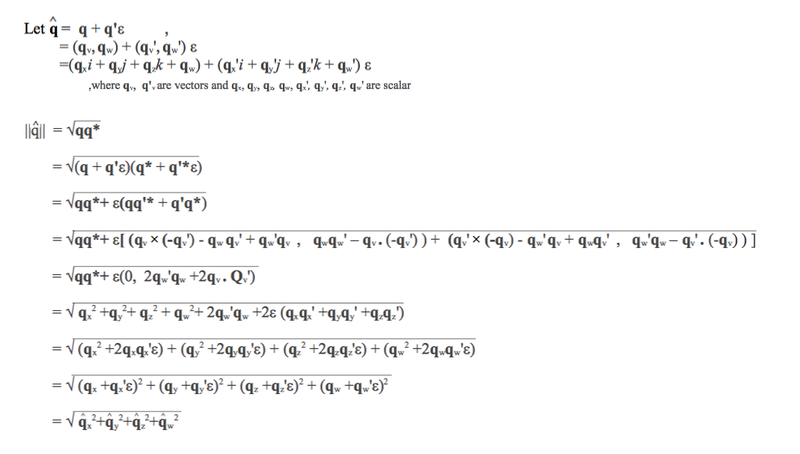 then multiply the translation dual quaternion with rotation dual quaternion will give the answer. note that the norm in the denominator is a dual number, which can be treated as 1 divided by the norm and gives another dual number (using dual number division) so that it can be multiply by a dual quaternion. Dual quaternion is an alternative way to represent a rigid transform other than matrix. And it may gives a faster accumulation of transformation if joint inferences per vertex is large enough according to "Spherical Skinning with Dual-Quaternions and QTangents". where the real number a is called real part and the real number b is called dual part. This gives a very nice property that we can find the first derivative, f'(a), by consider the dual part of f(a+bε), which can be evaluated using dual number arithmetic. we want to find the first derivative of f(x) at x = 2, i.e. f'(2). We can find it by using dual number arithmetic where f'(2) will equals to the dual part of f(2+ε) according to Taylor Series. Therefore, f'(2)= 8/9, you can verify this by finding f'(x) and substitute 2 into it, which will give the same answer. By using dual number, we can find the derivative of a function using dual arithmetic. Hence, we can also find the tangent to an arbitrary point, p, on a given parametric curve which is equals to the normalized dual part of the point p. For those who are interested in finding out more about dual number, I recommend to read the presentation "Dual Numbers: Simple Math, Easy C++ Coding, and Lots of Tricks" by Gino van den Bergen in GDC Europe 2009.